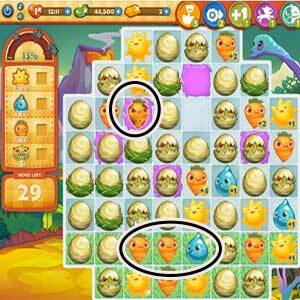 These Farm Heroes level 163 cheats and tips will help you beat level 163 of Farm Heroes. 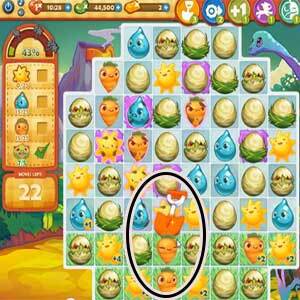 The objective of Farm Heroes level 163 is to collect 25 suns, 25 droplets, 25 carrots, and 5 dragons in 30 moves. The first thing you should be focusing on in this level is moving the grumpy crops down to the grass so they become happy again, happy crops will give you more points. Use your shovel booster early in the game on crops with added points on them. This well help you when you run out of moves at the end of the level. Level 163 Cheat #3: Don’t forget about the dragons! In Farm Heroes Saga Level 163, unlike ones before it, you will have to collect at least 5 dragons, this is fairly easy. 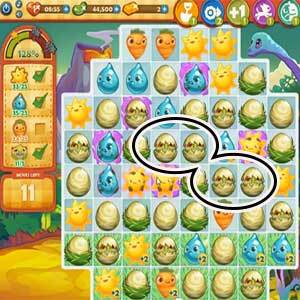 There are many dragons on the board and almost any crop combination around them will activate them.